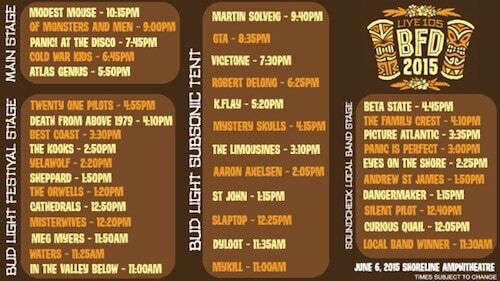 Live 105’s BFD is taking place on Saturday, June 6 from 11AM to 11PM. Ride The San Francisco Party Bus to BFD 2015! The SF Bus provides Round-Trip Transportation to every concert, Music Festival and Sporting Event in the Bay Area. Grab a seat on the BFD bus leaving from the Marina and makes things as easy as possible! Buses are BYOB, so feel free to bring along your favorite Beer, Wine or Liquor to enjoy on the way down. Buses will park near the entrance to Shoreline and leave 30 minutes after the festival is over. Feel free to arrive a little early and enjoy the Union Street Fair!